Over the last few months, the mainstream newspaper has been writing regarding the increase in doctors fee over and over again with multiple letters to the editor. The government has “sort of” approved a 14% hike in fees which is yet to be made official but the newspapers are running articles after articles as though the world is coming to an end. I had written about the issue over here and here. Today, the Star had yet again ran an article ( here and here) regarding this issue, comparing with the proposed fee increase by MMA. Obviously, our FOMCA representative and TPA VIce President do not know what they are talking about. The doctor’s fee has not increased since the last 15-20 years. A surgeon who has been in private practise for 20 years told me that his fee for doing an appendicectomy has not increased since he started his private practise! However, the total cost of an appendicectomy has increased from RM 2-3 000 when he first started, to about RM 7-8 000 currently! So, where are the extra charges coming from ? The answer is very simple, it is the hospital charges that has increased by leaps and bounds. But why over all these years, this so-called consumer association does not make any noise but when the doctors request for a 15-30% hike in their fee after 20 years, the whole world goes into chaos! The doctor’s fee are regulated by the government but not the hospital’s fee. If they are really sincere, they should go after the hospital’s fee which they would not, as almost all private hospitals are owned by GLC aka the government ! As what MMA President has said in the articles below, many doctors are struggling to meet the ends. The income of doctors are gradually declining as I had mentioned many times before but the cost of running a service has increased tremendously. The public feels that all doctors in private hospitals are employed by the hospital which is obviously not true. I had many of my patients who also thought the same until I told them the reality. We are just renting a room in the hospital to run our service. We have to pay a monthly rental and the hospital will also take 10-15% of our consultation fee as their administrative fee. Only the balance of our consultation and surgical fees are given to us. Then we have to pay for our indemnity insurance which is also increasing by about 8-10% annually. When there is any legal suit, the hospital will wash off their hands and you have to deal with it. The recent appeal court’s decision in awarding RM 3.5 million(not including interest) has set a new benchmark for further medico-legal suits in this country. That’s the reason MMI has increased their indemnity insurance for O&G by almost 100% this year. As for the public, private healthcare is an option. No one is forcing you to go to a private hospital/clinic. The government hospitals and clinics are always available for you with a very minimal charge of RM 1-5. So, why complain. If you choose to go to a private hospital, then don’t make a fuss out of it. Most patient who attend private hospitals nowadays are insurance paid. Only about 10-20% of patients are self paying. This is the trend that we are seeing lately. Insurance companies on the other hand are finding it difficult to cope with the increase in private healthcare cost. They have started to question many of the decisions made by doctors in the management of the patients. They are even scrutinising each and every blood test and X-rays that are done. There will come a point where it will collapse. Any increase in premium is not sustainable and this will lead to their inability to pay the hospitals. The bigger private hospitals will then not be able to sustain the operational cost and will eventually collapse. That’s what happened in the US in 1990s and many big tertiary hospitals collapsed due to high overhead cost. They restructured their hospitals with small community based hospital and 1-2 big tertiary hospital in each district. The insurance companies now dictate everything, as I had written over here. Similar situation will happen over here eventually. So, for those who do medicine thinking that they are going to make tonnes of money in the future by spending RM 500K for their “undergraduate” education ( which is of no value in the future without further postgraduate education) , please rethink your decision carefully. THink what you can do with that amount of money in so many other ways. Many out there think that medical postgraduate education is similar to undergraduate education. How ignorant our society has become. I had written about medical postgraduate education in this blog since I started blogging in 2010 but yet I get asked the same questions repeatedly. I can only say one thing: current generation do not read and want to be spoon-fed all the time. I don’t know how they are going to become a doctor where you need to read and search literature throughout your life……………….. 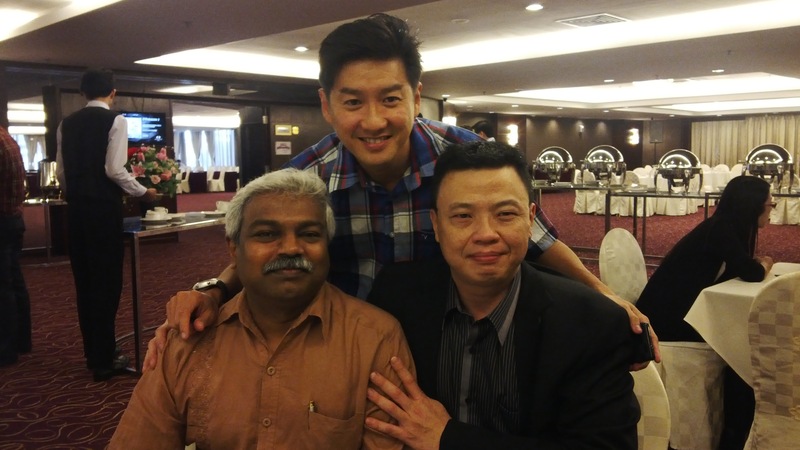 Finally, I was happy to meet DR Jim Loi today in JB ( sitting beside in the photo below). He is the President of MPCAM and MPCN which is a coalition of doctors whose objective is to create unity among doctors to stand as one voice. I wish him best of luck. I once wrote an article in MMA in 2006 ” Rebranding and Restructuring of MMA: An urgent need for a Revolution”. I hope MPCN can achieve what I had suggested then. PETALING JAYA: Patients will have to brace themselves for a “deeper cut” if a proposal to increase fees for specialist procedures is adopted by the government. Association of Third Party Medical Claims Administrators Malaysia (TPA) vice-president Paul Cheok said the Malaysian Medical Association (MMA), in asking for a 30% increase in consultation charges last month, had also proposed staggering increases in charges for specialist procedures. TPA members, who form part of the country’s managed care organisations, provide administrative and medical claim processing services for insurance companies and more than 1,000 employers, mostly corporations. “We are not against the approved 14.5% hike in consultation fees agreed on by the Health Ministry, but the MMA’s proposal for an increase in surgical procedures and anaesthetist fees must not be allowed. Patient volume has increased over the years, so based on the current rates, specialists are already fairly compensated,” he said. TPA estimates that there are about 800 to 1,000 procedures listed in the 5th Edition of the MMA Fee Schedule. Cheok said the MMA must also justify why certain procedures have been upgraded to a higher surgical fee category. “Some procedures which were previously categorised as minor, have been pushed into the ‘major category’. “Coupled with the new rates, this will lead to patients paying more than 200% of current charges. “Patients should be more concerned over the proposed cost of surgical procedures instead of worrying about a rise in consultation fees,” he said, adding that often, one operation consists of multiple surgical procedures which could lead to multiple charges. MMA president Datuk Dr NKS Tharmaseelan however said specialist procedure fees in Malaysia were still the lowest in the region. He said doctors should not be blamed for high hospital bills as their fees only amounted to 20% of the bills. “If hospital bills have risen, it is due to the hospitals charging higher fees for their services and other items,” he claimed. On TPA’s claim that MMA’s proposal to increase the fees for surgical procedures would lead to patients paying more than 200% than current charges, he said their calculations for the new fee rates for specialist procedures were “mere conjecture”. “I don’t know where they are plucking the numbers from,” he said. Medical Practitioners Coalition Association of Malaysia (MPCAM) and Malaysian Primary Care Network (MPCN) president Dr Jim Loi said the proposed rate for procedures are justified if “100% goes to the specialists”. “The cost of items and materials have risen in tandem with the current economic state and the total cost of procedures. Specialists need to invest a lot of money,” he said. PETALING JAYA: Consumers are unhappy that private healthcare charges are still being shrouded in secrecy, said Federation of Malaysian Consu­mers Association (Fomca) secretary-general Datuk Paul Selvaraj. “Will consumers only find out about the increase in specialist fees after they are slapped with a hefty bill?” he asked. Health director-general Datuk Dr Noor Hisham Abdullah said most of the professional fees submitted by the Malaysian Medical Association (MMA) in its latest proposal increased by 30% from the last one. “However, all medical practitioners in private hospitals have always adhered to the 13th Schedule of the Private Healthcare Facilities and Services (Private Hospitals and Other Private Healthcare Facilities) Regulations 2006 for their professional fees,” he added. He said the ministry would add new clauses to the regulations to reduce any attempt by medical practitioners to manipulate the cost of procedures. MMA president Datuk N.K.S. Tharmaseelan explained that the association was preparing a new, comprehensive fee schedule which would cover new procedures, such as advanced robotic and computer-assisted navigational surgery. Dr Tharmaseelan also dismissed a claim that specialists earn RM150,000 monthly, saying most specialists only earn an average of RM25,000 to RM30,000 per month. On Aug 23, a reader from Kuala Lumpur claimed that a private specialist earns an average of RM150,000 per month and “have ways to fleece the patients”. Citing an example, he said an ENT surgeon could do an operation and charge for four separate procedures. The current 13th schedule listing the procedure fees is based on the 4th edition of the MMA Schedule of Fees dated 2002, which is based on the original schedule copied from the British BUPA table. There are lots of discrepancies in that schedule, both in types of procedures, and the relative weightages. It is heavy on simple procedures, and underweight complex procedures. It is better to do two appendisectomies than a total gastrectomy, both yielding the same return. There is a need to restructure the entire list, to make it more contemporary, deleting obsolete procedures, and add new procedures, and more fairly weight the range of procedures. Unfortunately, any attempt at doing this will be seen as doctors trying to unreasonably increase fees. Doesn’t matter where you are in the world. From an overall point of view, doctors are never paid what they are truly worth. Stil rm24-30k per montb is alot..
That’s another misconception. Remember, you are only going to earn this much after 15 years of working and studying. Furthermore, you are earning this by working 24 hours a day 7 days a week. 20% tax need to be paid even if you form a company. Trust me, if you are going to earn this much by working 24 hours a day, it is not worth it. Simple solution to a complex problem===== whoever now is working and retired people irrespective of which party u support the govt of the day comes to the aid of them all those who are going to the job market fresh all must take a insurance policy compulsory like payment to EPF so if u want better treatment & if your salay is high then u take a better insurance policy ,today I see a person who earns say Rm 3500 per month wants to go to the best medical center for treatment either for them or the loved ones this is wrong . Well this is the way how the world works so open up your eyes please do not go to these high tech establishment 7 THEN SAY THEY CHARGE EVEN FOE A GLASS OF WATER . We should buy insurance for medical bill above a threshold. Common problem like appendicitis or gastritis etc can be managed reasonably by public hospital. We should buy insurance which insures you for bill above certain amount says RM30k. This will reduce the premium tremendously. I agree with Dr Pagalavan. I am a lawyer doing defending work for medico-legal cases and what most patient (majority of them) was not aware is the fact that doctor have to pay high premium for insurance coverage because of the high litigation rate against doctors. In fact, the premium for the MMI Scheme has just increased in July 2013 and as highlighted by Dr Pagalavan, the Courts had awarded very high damages and in fact if we are talking about the said same case, in fact the High Court awarded above RM6 million. Therefore, I think the increase is justified and that what should be scrutinize should in fact be the hospital charges. Some patient even thought that doctors will get a certain commission from the hospital charges ie. from the test that they ordered or simply from the medication prescribed by the doctors, but as far as within my knowledge, doctors does not get a single sen out of it and in fact as pointed out by Dr Pagalavan, the doctors have to pay rental and administrative fees to the hospital. Doctors are only independent contractor of the hospital. thanks for the comment. I think we are talking about the same case. I said RM 3.5 mil without interest! Despite the 300% increase the amount insured is still the same. In other words, medico legal cases no matter how high the award WILL NOT affect the insurance industries because they can just pass the cost to the consumer (patient) by increasing the premium for doctor who will definitely pass the cost to end users. The more the payout by medico legal cases the higher the cost of healthcare to consumers. I believe most doctors don’t charge the maximum rate so there is still a lot of room for increament of fee especially the consultation fee. Consultation fee , yes but most consultants already charged maximum for surgical fees. Do you think MPCAM’s formation is a reaction to MMA not performing?